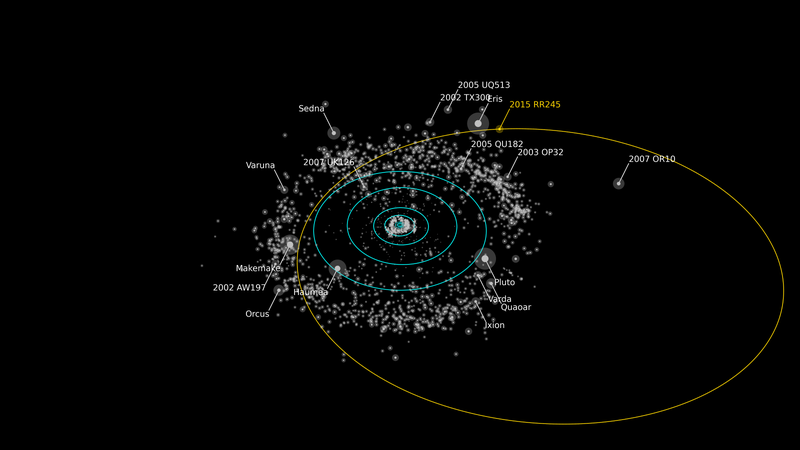 Say hello to 2015 RR245, a 440-mile-wide dwarf planet located approximately 7.5 billion miles from the sun. It takes 700 years to make a complete orbit, making it one of the most remote known objects in the entire solar system of significant size. The newly discovered dwarf planet was discovered by an international team of astronomers using the Canada-France-Hawaii Telescope on Maunakea, Hawaii, as part of the ongoing Outer Solar System Origins Survey (OSSOS). Astronomer J.J. Kavelaars from Canada’s National Research Council was the first to spot the minor planet in February 2016 while pouring through OSSOS images taken back in September 2015. “There it was on the screen—this dot of light moving so slowly that it had to be at least twice as far as Neptune from the Sun,” Michelle Bannister, an astronomer at the University of Victoria in British Columbia, and a postdoctoral fellow with the survey, said in a statement. Our solar system is home to a bunch of trans-Neptunian dwarf planets (such as Pluto, Makemake, Sedna, and Eris), but RR245 is exceptional because its aphelion (i.e, the point that is the furthest distance from the sun) has been estimated at a whopping 10 billion miles (17 billion kilometres) from the sun. It’s so far that light from the sun requires 16.63 hours to get there. By comparison, it takes nearly seven hours for the sun’s light to reach Pluto. RR245 is currently approaching its perihelion, which should happen around 2096. Astronomers say it’s the 18th largest object in the Kuiper Belt, and that it likely formed some 100 million years ago. Like other minor planets that formed within the protoplanetary disc, it slowly drifted outward. Many minor planets were destroyed or thrown out from the solar system during this process, but RR245 managed to hang in there. Earlier this year, researchers from Konkoly Observatory detected 2007 OR10, a minor planet nearly the size of Pluto. The Kuiper Belt is home to thousands of much smaller trans-Neptunian worlds, the vast majority of which are still yet to discovered. Previous surveys have detected a small handful of these objects, but RR245 may be one the last large worlds beyond Neptune to be detected until larger telescopes come online in the coming decades.